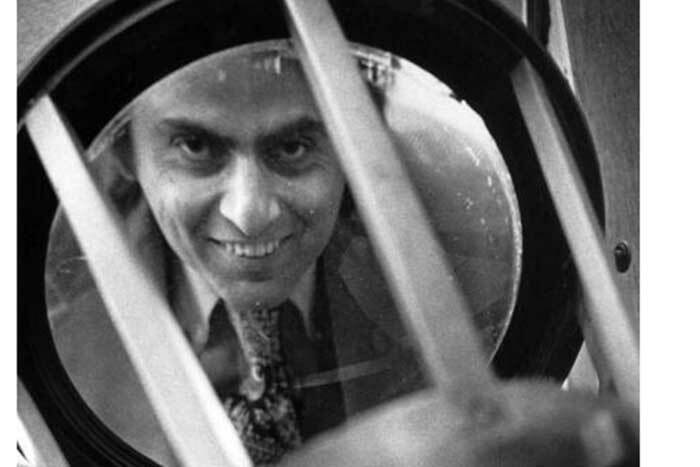 Carl Sagan, 1975 recipient of the Priestley Award, looks through Joseph Priestley's burning glass on April 10, 1975. The Joseph Priestley Award is presented by Dickinson College in memory of Joseph Priestley, discoverer of oxygen, to a distinguished scientist whose work has contributed to the welfare of humanity. The award, first presented in 1952, recognizes outstanding achievement and contribution to our understanding of science and the world. 2017-18: Richard Alley, for his work on using ice sheets and glaciers to recognize abrupt climate change and for his tireless efforts to educate the global citizenry of the potential risks. 2016-17: Kelly Brownell, for his outstanding contributions to the field of psychology, particularly his research on food advertisement, obesity prevention and health legislation that has led to positive changes in food labeling and public policy. 2015-16: Steven Strogatz, for his interdisciplinary work in the field of nonlinear dynamics of complex systems, in particular his contributions to a rigorous understanding of spontaneous synchronization of systems and networks encountered in physics, biology, engineering and math, and for his skill at communicating science and math to a general audience. 2014-15: W. Timothy Gowers, his distinguished contributions to functional analysis, combinatorics, and number theory, and for his leadership in enhancing the mathematical and scientific community. 2013-14: James Hansen, former director of NASA's Goddard Institute for Space Studies, for his work on the climate crisis. In his Priestley lecture (Nov. 7, 2013), Hansen discussed the public view of the crisis, seen from a scientist's perspective, the need for governments to address the crisis effectively. He also offered options for young people who wish to respond to the intergenerational injustice of human-made climate change. 2012-13: Joan A. Steitz, for her foundational work on aspects of RNA processing, regulation and function, particularly her crucial discoveries concerning the fundamental roles of small RNA-protein complexes in cells, and for her long-standing advocacy for women in science. 2011-12: George Whitesides, professor and researcher at Harvard University, for his groundbreaking "Lab on a Chip" medical diagnostic technology and humanitarian work bringing low-cost medical diagnostics to the developing world. 2010-11: Steve Sparks, professor of geology and research group leader of the Volcanology and Geological Fluid Dynamics Research Group at the University of Bristol, United Kingdom, for his contributions through applied fluid dynamics to improving our understanding of magmatic fragmentation and pyroclastic density currents, helping to reduce the risks posed by volcanic eruptions to at-risk populations globally. 2009-10: Elizabeth Loftus, for her work in the field of human memory research, particularly her contributions to our understanding of childhood abuse and traumatic recovered memories. 2008-09: Joseph Taylor, for his Nobel Prize winning work on binary pulsars and relativistic gravity. 2007-08: Vinton Cerf, for his key technical and managerial role in the creation of the Internet, in particular, for leading the development of the TCP/IP protocols. 2006-07: David Pimentel, for his contributions in ecology and agricultural sciences. 2005-06: Peter Agre for his distinguished contributions to the field of biological membranes and aquaporin water channel proteins. 2004-05: Jacqueline K. Barton for her groundbreaking approach to the study of DNA and understanding consequences of damage to DNA within the cell. 2003-04: Orrin H. Pilkey for his distinguished contributions on beach replenishment and other forms of shoreline stabilization. 2002-03: Jocelyn Bell Burnell, for her groundbreaking discovery of pulsars and contributions to the astrophysics of compact objects. 2001-02: John H. Conway for distinguished contributions to the field of applied and computational mathematics. 2000-01: Edward O. Wilson, for distinguished contributions to the field of conservation biology. 1999-00: J. Michael Bishop, for his distinguished contributions to our understanding of the molecular mechanisms of cancer. 1998-99: Bruce N. Ames, for his contribution to basic and applied research on mutation, cancer, and aging. 1997-98: Frank Press, for his contributions in geophysics and national science policy. 1996-97: Leon M. Lederman, distinguished contributions to our understanding of particle physics and its interaction with cosmology. Nobel Laureate in Physics 1988. 1995-96: Marvin Minsky, for distinguished contributions in the field of artificial intelligence. 1994-95: Gerald Holton, for distinguished contributions to the welfare of mankind through the field of the history of science. 1993-94: George Masters Woodwell, for distinguished contributions to global ecology. 1992-93: Solomon H. Snyder, for distinguished contributions to the field of neuroscience. 1991-92: Harry B. Gray, for his contributions to bio-chemical-inorganic chemistry and inorganic photochemistry. 1990-91: Wallace S. Broecker, for distinguished contributions to the field of geochemistry. 1989-90: Arno A. Penzias, for his contributions in the field of radio astronomy. Nobel Laureate in Physics 1978. 1988-89: Francis H.C. Crick, for his pioneering contributions to the field of molecular biology. Nobel Laureate in Physiology or Medicine 1962. 1987-88: Thomas F. Banchoff, for his contributions to the understanding of four dimensional manifolds through computer graphics. 1986-87: Roald Hoffmann, for his contributions to applied theoretical chemistry. Nobel Laureate in Chemistry, 1981. 1985-86: Harold P. Furth, for his contributions to plasma physics. 1984-85: Hubert M. Alyea, for his contributions to chemical education. 1983-84: Stephen Jay Gould, for his contribution to the fields of paleontology, evolutionary biology, and the history of science. 1982-83: Peter H. Raven, for his work in systematic botany and biogeography. 1981-82: Donald Knuth, for his work on computer programming and the design of computerized typography. 1980-81: Philip Morrison, for radioastronomy studies. 1979-80: Melvin Calvin, for work in the chemistry of photosynthesis. Nobel Laureate in Chemistry 1961. 1978-79: J. Tuzo Wilson, for distinguished contributions in the development of plate tectonics. 1977-78: W. Frank Blair, for environmental studies and ecology. 1976-77: John G. Kemeny, for the development of BASIC computer language. 1975-76: Carl Sagan, for his contributions to the exploration of the universe through radioastronomy. 1974-75: Henry Eyring, for his contributions to theoretical chemistry, the development of absolute reaction rate theory. 1973-74: Philip H. Abelson, for geochemical studies. 1972-73: George C. Pimentel, for work in infrared spectroscopy and molecular structure. 1971-72: Margaret Mead, for distinguished contributions to the field of anthropology. evolution. Nobel Laureate in Medicine 1967. 1969-70: Linus C. Pauling, for research on the nature of chemical bonding. Nobel Laureate in Chemistry 1954 and the Nobel Peace Prizein 1962.1968: Marshall W. Nirenberg, for the discovery of the genetic code. 1967-68: George W. Beadle, for work in cytology and genetics. Nobel Laureate in Medicine 1958. 1966-67: Charles H. Townes, for his work in microwave spectroscopy and masers. Townes was a Guggenheim Fellow and a Fulbright lecturer and was named a Nobel Laureate in Physics in 1964. 1965-66: Joel H. Hildebrand, for research in the fields of solubility and the structure of liquids. 1964-63: Isador I. Rabi, for his work with quantum mechanics and molecular beams. He contributed to the invention of the atomic clock and was named a Nobel Laureate in Physics in 1944. 1963-62: Kenneth S. Pitzer, for work in theoretical quantum chemistry. 1962-63: Robert W. Woodward, for the synthesis of organic molecules. Nobel Laureate in Chemistry 1965. 1961-62: Maurice Ewing, for distinguished contributions in the fields of oceanography, climatology, and geothermal measurements. 1960-61: Glenn T. Seaborg, for distinguished contributions through nuclear chemistry. Nobel Laureate in Chemistry in 1951. 1959-60: Willard Frank Libby, for distinguished contributions to the development of carbon dating. Nobel Laureate in Chemistry in 1960. 1958-59: George Bogdan Kistiakowski, for work in chemical kinetics and thermodynamics. 1957-58: Edward Teller, for distinguished work in nuclear physics. 1956-57: Detlev W. Bronk, for distinguished service to mankind through biochemistry. 1955-56: Harold C. Urey, for the discovery of deuterium. Nobel Laureate in Chemistry 1934. 1954-55: Karl T. Compton, for peacetime use of atomic energy. 1953-54: Paul R. Burkholder, for the discovery of chloromycetin. 1952-53: Sir Hugh Stott Taylor, for research and teaching in physical chemistry.